For many years, ‘Dyaco’ has been a leading manufacturer of fitness equipment, and the quality of their products has led to worldwide acclaim. Since 2009, there has been a third brand name to come out of those prestigious factories, and 5 years on, the name ‘Xterra’ finally hits our shores! This is one out of a range of 4 elliptical cross trainers that are now being distributed in the UK. Let’s check out the penultimate model in the range – the Xterra FS5.6e! In terms of overall shape, it sports a chunky yet stylish appearance with good looks, and we like the predominant use of black throughout the Xterra range that gives it individuality. The ‘5.6’ is capable of carrying a user weighing up to 26 and a half stone, and there’s a lifetime warranty on the frame plus 5 years on parts and 2 years labour – clearly this machine is built to last! There are 3 pairs of levelling feet positioned under the front, middle and rear beneath the frame, which need to be adjusted to ensure the machine is sitting flat on the floor. Once level, the cross trainer felt nice and stable in use and the dynamic handles and crank arms are constructed from fairly thick gauge steel so there’s not too much flex under pressure. The flywheel weighs a respectable 21 lbs which is the same as the cheaper models in the Xterra range (the next model up has a 25lb flywheel). The overall biomechanical engineering that has gone into angling the crank arms and pivot points clearly shows the expertise of a manufacturer with a wealth of training knowledge. 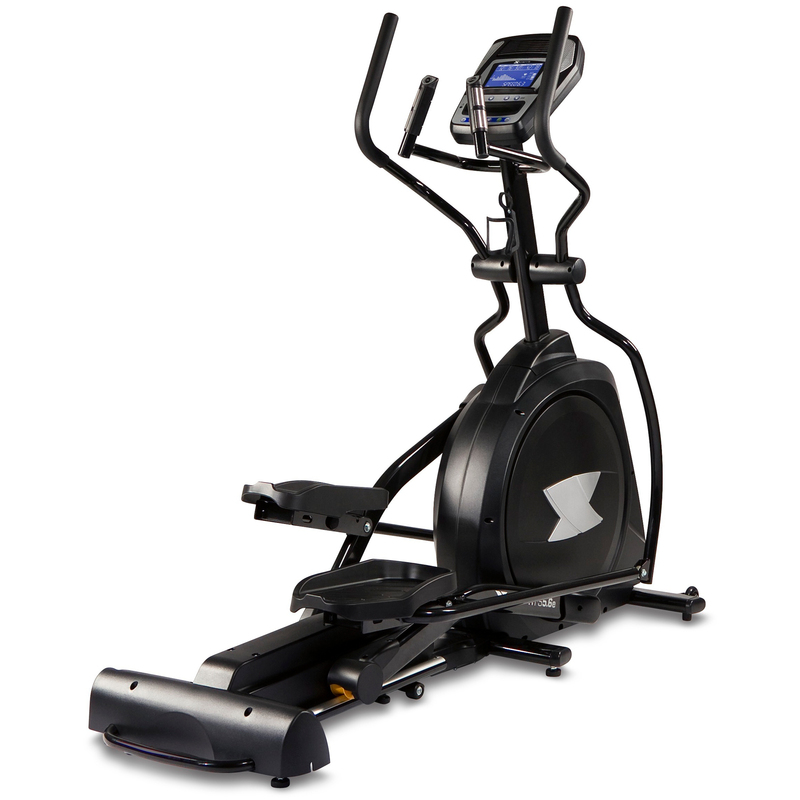 The motion feels wonderfully smooth as well as safe on the joints…if you closed your eyes you could well believe you were using a vastly more expensive machine – but the quality feel is a reminder that this model is from the same fitness equipment master manufacturers that have been producing ellipticals for many years. User comfort appears to have been a key consideration in the design of the ‘5.6’ elliptical, starting right down at the feet! The huge pedals measure 9 inches wide so there’s plenty of surface area to get a secure stance, plus they have also been angled with a 2 degree inward slope to promote a more natural alignment of the body. Another important aspect which hasn’t escaped the consideration of the designers is the spacing between the pedals. Being a front-driven cross trainer permits the pedals to travel closer to each other than is possible on a rear drive machine because there isn’t the obstruction of the flywheel casing. In this case there’s little more than a fingers width between the pedals so once again encourages a natural gait. There are 20 levels of electronic incline which is a fantastic feature to vary the feel of the workout as well as to keep it challenging. As the incline motor raises the guide rail section by pivoting at the rear, you can really feel the difference in motion as well as in your leg muscles! When you consider that the range takes its name from some of the most challenging outdoor endurance events around the world, it seems only fitting that this machine replicates the sensation of tackling varying terrains and gradients. Our main reservation in terms of challenges for very advanced users stems from the resistance capabilities. There are 20 levels of resistance and maximum is certainly going to feel tough for most users, but for any hardy triathletes conditioned to Xterra event standards, the tension may feel a little weak if you’re working in short bursts of maximum exertion. To keep control of the action, the 5.6e has controls on the static handles as well as the conventional console buttons. The handles are equipped with neat thumb controls on the end of each so you can adjust the intensity levels (Up arrow on the left and down on the right handle). Typically, the handles also have integrated pulse sensors, but we’d recommend purchasing a wireless chest strap to give you more accurate readings from the inbuilt receiver. Plus there are 2 heart rate controlled programs which require a chest belt, so the small investment is well worth it. Before we get into the program features, the console is worthy of a mention for being wonderfully user-friendly and easy to read. The display screen is fairly large, measuring 135mm x 85mm and the layout is very clear. The top of the screen contains a row of dedicated feedback windows displaying RPM/Calories/Time/Distance and Pulse which all stand out in white against the blue backlit display. In the centre of the screen is a dot matrix to show the selected course profile and to the side of that is a Heart Rate profile gauge to show your pulse percentage at a glance. Running along the bottom is a scrolling message window to give instructions during setup or during a program the user can get a ‘scan’ through other data every few seconds to automatically show incline…Speed…Watts…Altitude…etc. It’s hard to imagine how this console could be made any more intuitive or clearer. That said, it’s not without its limitations. There are 5 pre-set programs plus 2 HR controlled, 2 User-defined and Manual. Certainly enough to keep things varied and challenging for most users, but compared to the spec lists of some other similarly priced machines, the features may seem a little basic. However, to really appreciate the variety of the programs takes a closer look. For one thing, each program is very unique so this isn’t just a case of a few tweaks to peak levels here and there, the structure of each is entirely different catering for a variety of goals. 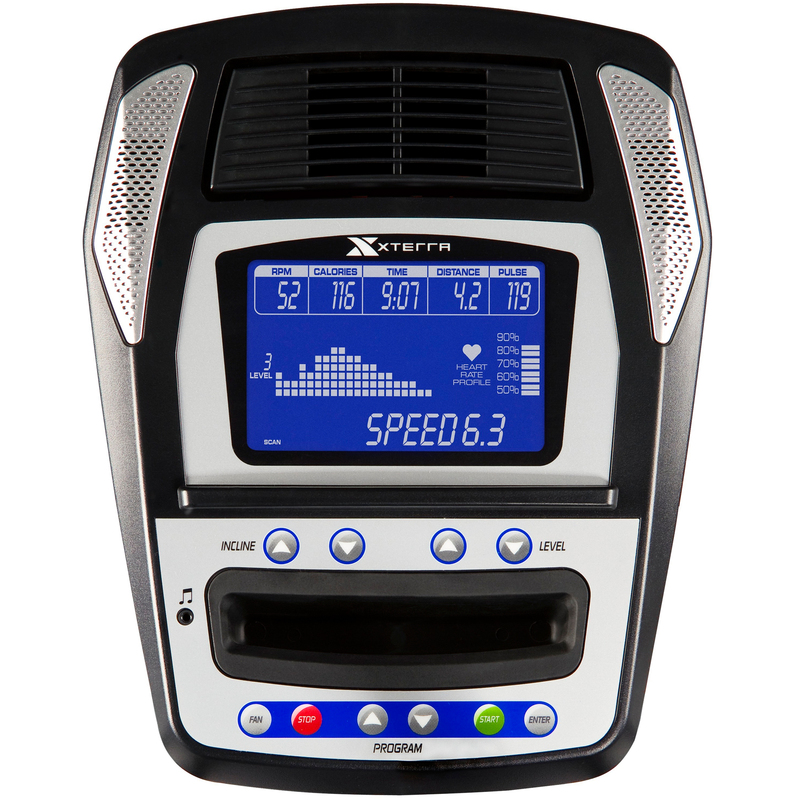 Plus, all of the programs are customizable so the user can adjust the duration (from a minimum of 10 minutes up to 99 minutes), alter the peak resistance level and the maximum incline level too. During this set-up, the user can input their age and weight to help the computer calculate more accurate calorie consumption figures. There is also the option to bypass all of this and jump straight into the action using the default settings. The 2 user-defined programs give you almost unlimited options as they allow the user to create and store their own customized sessions. These can be saved for future use or re-constructed when it’s time for a change. There’s a storage slot for your phone or Mp3 player which can be hooked up to the audio jack and the sound quality through the speaker system is surprisingly tight and clear. There’s a swivel fan that blows a faint stream of air to keep you cool. A ledge on the console can hold your tablet and a bottle holder on the console mast keeps your free Xterra bottle close at hand. But if you’re looking for downloadable programs, internet connectivity and stacks of techie gadgetry, then the ‘5.6e’ is going to leave you underwhelmed. So what do we think overall? As we’ve established, if you’re looking for motivational entertainment features and technological innovation, then we’d suggest you keep looking. This machine (and the Xterra range in general) is designed with the focus on performance rather than entertainment. In view of that objective, there may be obvious links to it’s namesake ‘Xterra’ but let’s be cynical for a moment and assume it’s just a rather captivating brand name! After all, if you’re the type of person to get your kicks from enduring Xterra events, then you’d perhaps opt for a machine with more tortuous resistance capabilities! Where this elliptical really excels is in overall ‘feel’. Biomechanically, it’s spot on! The care and consideration that has gone into the design and engineering of the ‘5.6e’ make the elliptical motion feel smooth, wonderfully comfortable and safe on the joints. The electronic incline feature also offers something seldom featured at this price point. The build quality is exemplary and the maximum user weight exceeds most other rivals too. For anyone on the lookout for a well built, user-friendly elliptical with electronic incline and a decent selection of programs, then the Xterra 5.6e is a recommended option. The Xterra Free Style 5.6e is not currently available from any retailers we're aware of in the UK. The Xterra 5.6e has a 20 inch stride length with a nice feel, an incline ramp that's electronically controlled. It's an easy machine to recommend at this price point for all round toning work. Another machine worth considering for similar money is the DKN XC-160i. This doesn't have an incline ramp, but does have a massive 20kg flywheel, superb feel with biomechanically perfect motion and a top level of resistance that'd challenge the fittest of users.